The CAV 45H air powered industrial vacuum cleaner is suitable for picking up hazardous dust and debris in gas zone 1 & dust zone 21. 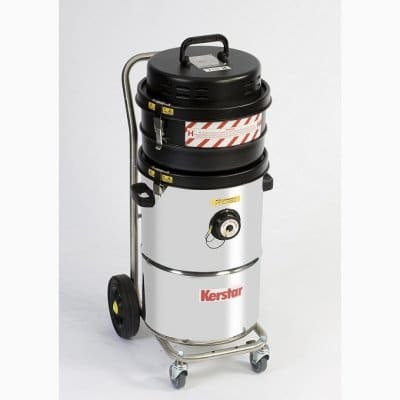 All models are supplied on a stainless steel caddy with braked castors and conductive wheels where applicable and all models are fully earth bonded and have an anti-static (conductive) vacuum and air supply hose. 2 x 200 mm Conductive Wheels On A Heavy Duty Tubular Stainless Steel Caddy. Canister Detachable From Caddy.